The World Economic Forum (WEF) has just published their report on “A Blueprint for Digital Identity”. It begins with a disclaimer from “Deloitte”* saying that “This publication is not a substitute for such professional advice or services, nor should it be used as a basis for any decision or action that may affect your business”. But what’s the point of reading a report that isn’t going change any decision or action that you make? I think quite the opposite: you should read the document and make the decision to have a strategy towards digital identity and start to explore different scenarios covering how it will affect your business right away. Banks ought to be looking at both providing and consuming identity services and developing better identity and authentication services not merely for their internal use to reduce phishing and pharming but as a line of business in an online society. They are the obvious category of institution to provide credentials, manage personal information and deliver identity into the marketplace. The WEF report says that “There is a strong business case for Financial Institutions to lead the development of digital identity systems” and goes out to categorise these are cost reduction, new revenue opportunities and transformational new models (i.e., outside core banking). I agree that it’s important to look at the saving money and making money opportunities in this way because in any bank that I’ve spoken to about this sort of thing, it’s been clear that the saving money business case has to stack up before there will be any investment. I’m rather in favour of the middle option as I think it delivers immediate improvements to the day-to-day transactions of modern life and it is, above all, feasible. But what exactly would it implement? The model of identity transactions that the WEF present (page 43), which divides identity transactions into authorisation, attributes and authentication is I think a little too narrow. The model we use at Consult Hyperion (“Three Domain Identity”, or 3DID) provides a better platform for discussion and exploration (but then I would say that wouldn’t I) because it makes the relationships between identities, attributes, credentials and so on more explicit. When it comes to discussing archetypes (or “marketectures”) that will make sense (page 62), the use of the 3DID model makes it easier to understand the different options but considering who will control each of the domains. If, as WEF recommend, it is the financial institutions who control the Digital Identity and they link this to a variety of Mundane Identities from different sources and well as to a potentially large numbers of Virtual Identities (where credentials are held, essentially) it gives them a pivotal role. This might be in a federated structure, where each banks holds its own KYC and makes it available to other banks, or some other options. 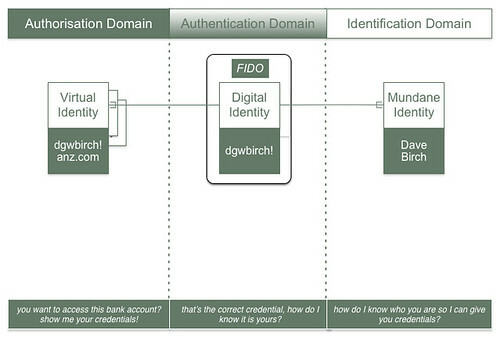 However it’s done, the authentication (proving you control the digital identity) is another matter. One of the reason why I have such an interest in the “middle way” WEF blueprint is that I’ve been part of a techUK working group looking at this since 2014. A ‘financial services passport’ refers to an aspirational digital identity, issued by UK financial services providers, and mutually recognised across the financial services industry. Such a passport would not only be used for financial services and for the benefit of financial institutions. It could be used to improve all sorts of services that desperately need a proper identity infrastructure. It could with internet dating, protecting people on twitter from trolls, access to adult services and other “sharp end” applications of digital identity that would be transformational not only for bank revenues but also for consumers in the mass market. The solutions to the big, immediate problems in these areas come not from the digital identity itself but from the virtual identities built on top of it, because the virtual identities are a way to communicate attributes rather than identity. So what might banks do with your identity once they’ve got it safely locked away in their vaults? Well, one idea, particularly popular with me, is that they might give you a safe, pseudonymous virtual identity to go out an about with. The idea of strong pseudonymity is particularly appealing: a pseudonymous virtual identity with a bundle of credentials attested to by regulated financial institutions should be more than enough for almost all day-to-day transactions. This would allow for a new tranche of what economists call “incentive functions” to be created by banks, encouraging transactions where none would have taken place otherwise. But back to the WEF report. In conclusion, despite my preference for our model (! ), when it comes down to it, I think that the middle way (the consortium approach) is the place to start and I strongly agree with the principal recommendation of the report, which is that (page 101) “Implementation of a digital identity system should follow a bottom-up approach”. What the WEF calls “natural identity networks” I might be very tempted to label”communities”. So let’s create identity solutions for communities (starting with the financial services passport for the retail financial community of customers, providers and regulators) and find ways to interconnect them rather than trying to think up some kind of top-down “World ID” for the communities to implement. * “Deloitte” refers to one or more of Deloitte Touche Tohmatsu Limited, a UK private company limited by guarantee (“DTTL”), its network of member firms, and their related entities. DTTL and each of its member firms are legally separate and independent entities. DTTL (also referred to as “Deloitte Global”) does not provide services to clients.